Technology giant Microsoft has released a commercial in which the popular song "Let There Be Peace on Earth" is performed with the reference to God omitted. A television commercial posted on YouTube last week featured Microsoft employees and a children's choir singing the song to employees at an Apple store. The rendition of the song omitted the line "With God as our Father, brothers all are we / Let me walk with my brother in perfect harmony." Instead, the video of the singers jumped from the line "the peace that was meant to be" to the line "Let peace begin with me," which begins the next verse. Microsoft's seasonal video was uploaded on Tuesday to YouTube, with it appearing occasionally in ads before other videos on the YouTube site. 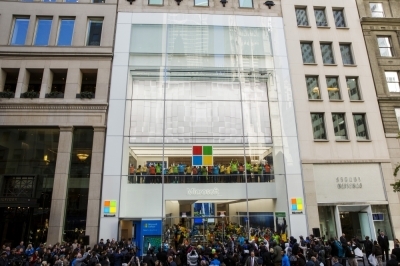 "To celebrate the holidays, Microsoft employees, who were selected from across the country, gathered together, meeting each other for the first time, at the new Microsoft 5th Avenue store to spread some holiday wishes," noted Microsoft's video description. "Joined by a local NYC children's youth choir, they share a message of peace and harmony with their neighbor down the street." As of Monday morning, the video has garnered over 1.3 million hits, as well as more than 3,500 likes, but also over 100 dislikes and the occasional comments denouncing the omission of the song's religious aspect. The intended message of the video was to show Microsoft employees singing the song as a peaceful overture to rival Apple. Curiously, a "behind the scenes" video about the secularized performance outside the Apple store uploaded three days after the ad did include footage of the choir singing the "With God as our Father" line. "Let There be Peace on Earth" was written by Jill Jackson-Miller in 1955, with her husband, Sy Miller, composing the melody. In addition to being widely recorded and performed across the United States, the song has also appeared in some hymnals. This is not the first time that efforts have been made to change the lyrics of the 1955 song. Other, more gender inclusive versions of the lyrics exist. These include versions that change "With God as our Father" to "God our Creator" and "brothers all are we" altered to "we are family."